Order one for each MI office and location to be fully compliant. The OSHA poster is included on the Michigan Complete Labor Law Poster. When you order the Michigan Complete Labor Law Poster, it will satisfy your State, Federal, and OSHA posting requirements with one poster. 01/2019 - Minimum Wage Poster - Revised to include new 2019, 2020, and 2021 minimum wages as well as the new governor and director names. 01/2019 - Paid Medical Leave Act - Completely new poster added with information about sick leave coverage, accrual and usage. 03/2017 - Discrimination - Updated with redesign of poster, including a new department logo and a requirement for persons with a disability needing accommodations for employment to notify their employers in writing within 182 days. 10/2016 - Minimum Wage Poster - Updated to reflect new 2017 minimum wage rate of $8.90, effective January 1, 2017. 09/2015 - Right-to-Know/SDS - Updated with new telephone numbers and website information. 05/2015 - Minimum Wage Poster - Minor update to department logo. 02/2013 - Child Labor Law Poster - Updated working hours for working minors. Only applicable to employers that employ minors. 01/2013 - Right-to-Know/SDS - Update to the OSHA poster "Right to Know"; very minor update that omitted "material" to now only being "Safety Date Sheet". 05/2012 - Workers' Compensation - New Workers Comp. poster, poster is not mandated by MI Workers Comp Agency. 02/2012 - Unemployment Compensation - Unemployment Insurance section updated new logo for U.I. panel. 02/2012 - Minimum Wage Poster - Min. Wage updated, noting that Min. Wage poster is a “MIOSHA Required Poster”. 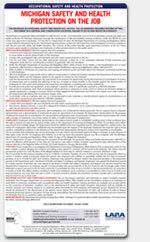 Many industries such as the restaurant, retail, construction, and professional use the Michigan Complete Labor Law Poster to satisfy their compliance requirements for State, Federal, and OSHA. When posted in an area frequented by employees, the Michigan Complete Labor Law Poster puts a business in full compliance. Federal contractors and subcontractors are required to display more postings in addition to the general State, Federal, and OSHA regulations. Please click here to see the federal contractor and subcontractor posting requirements. Ensure your full compliance by posting the Michigan Complete Labor Law Posters with the federal contractor-required postings.